First, there is Max's. Then came Jollibee. 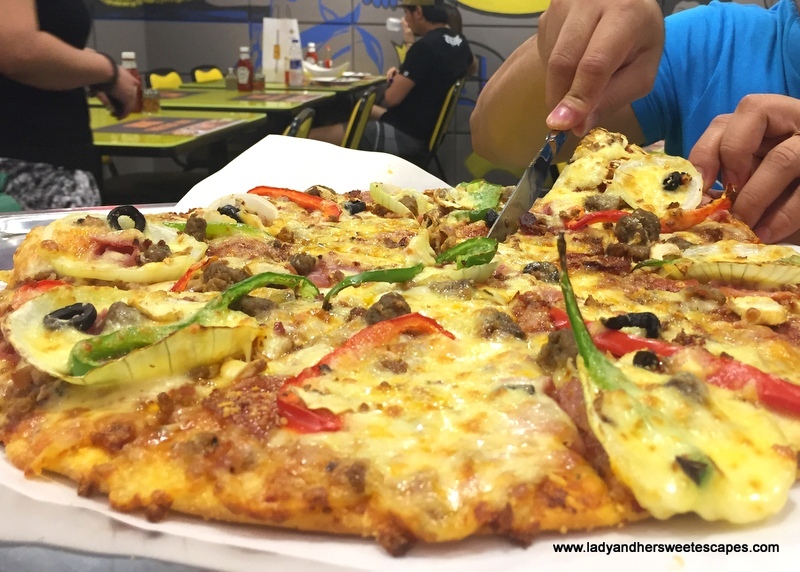 And now, Yellow Cab! Yellow Cab, UAE's newest import from the Philippines, is a well-loved pizza chain back home. I have been a fan ever since a branch opened in SM Bacolod, which apparently became a constant date night venue for me and Ed. 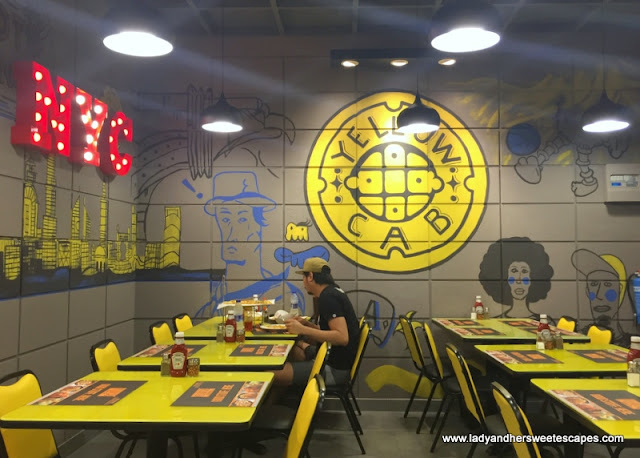 You can tell how excited we were when we first heard about the opening of Yellow Cab in Dubai. The first branch is located in Satwa, quite far from home and not accessible by metro; hence it took us awhile to pay a visit. 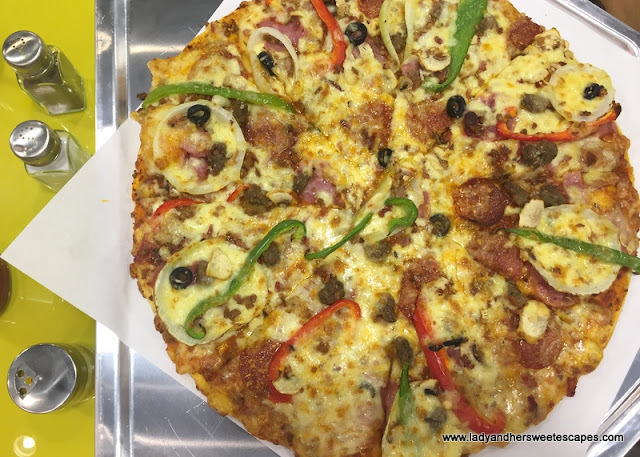 Early this month, we came to know that we don't need to go to Satwa to grab our fave New York's Finest signature pizza as the branch across in BurJuman Centre has finally opened its doors! 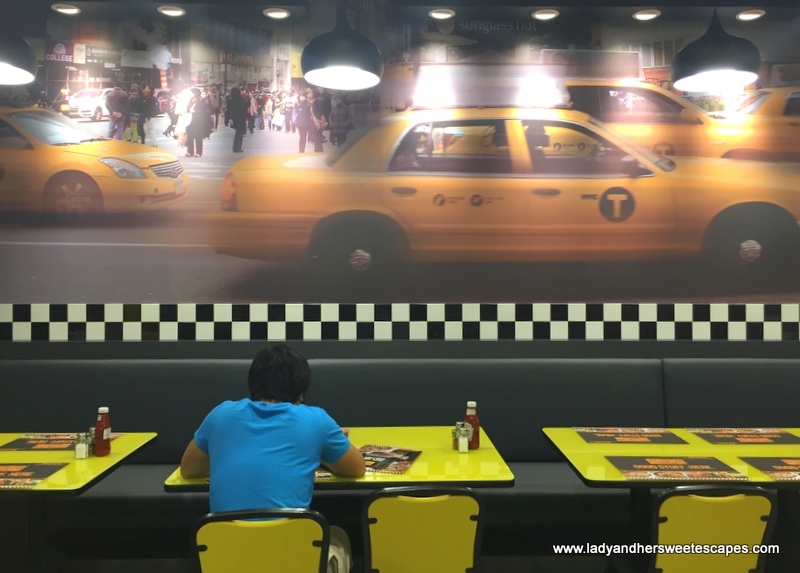 The second branch of Yellow Cab in Dubai was newly opened when we came; hence it was nearly empty. It was just us and two other couples indoor, and a few tables occupied outside. I was surprised to see that it's not packed (Guys, don't you miss Yellow Cab? ), but I was thankful that we didn't have to queue! The ambiance at Yellow Cab in Karama is similar to the ones we have back home. It is hip and edgy, a good place to chill and eat comfort food after a busy day at work. The menu is also identical. Signature Pizzas are offered - Four Seasons, New York's Finest, Roasted and Garlic Shirmp and more. 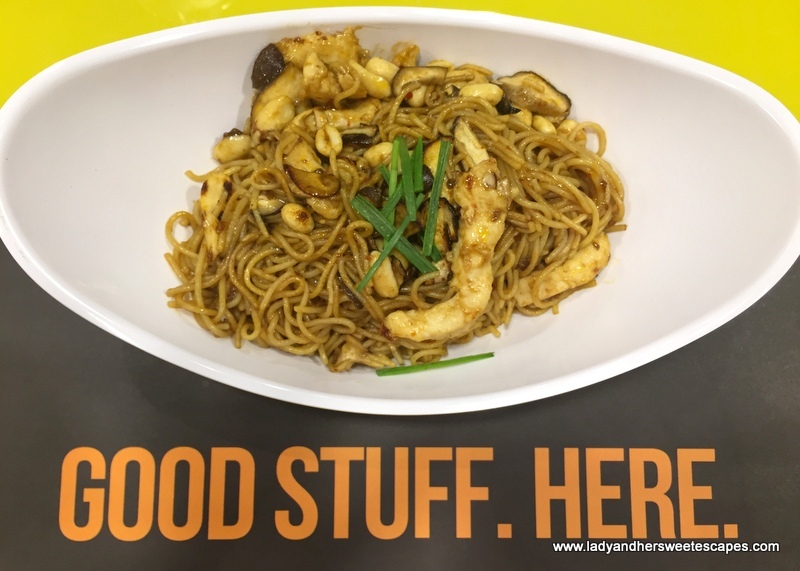 Dear Darla and Charlie Chan are present as well along with all the good stuff Yellow Cab is famous for! The service is somehow different. 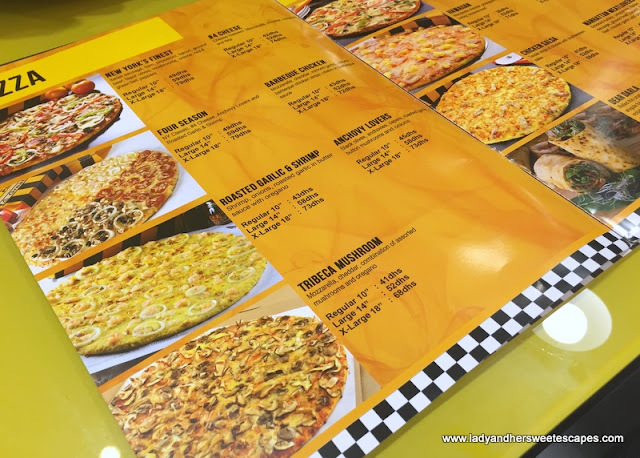 In my hometown's Yellow Cab, we order in the counter just like in a fast-food restaurant. In Karama, our order was taken by a staff while we sat comfortably. We're a little spoiled here in Dubai, aren't we? 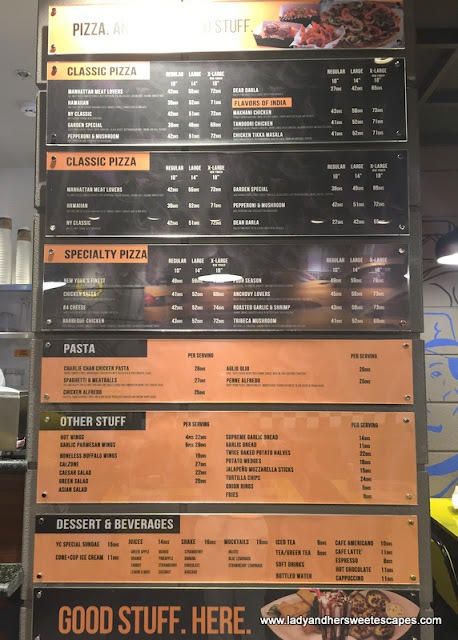 Anyway, for our first dining experience in Yellow Cab Dubai, we opted to have our classic faves aka those that can bring back memories of our first few date nights in Bacolod. We had a 14 inch pizza; New York's Finest all the way although we had an option to have half of it in another flavor. I'm so happy to say that we were not disappointed. It's exactly the pizza that we fell in love with years ago! It has the right amount of cheese, generous meat toppings, and New York-style pizza crust! Pizza would be lonely without pasta, so we ordered Charlie Chan along with the New York's Finest. The unique pasta is Yellow Cab's best-seller. It has roasted peanuts, shiitake mushrooms, chicken strips, tossed in spicy Oriental sauce! This is my best option when I'm completely jaded with the usual tomato or cream-based pastas! 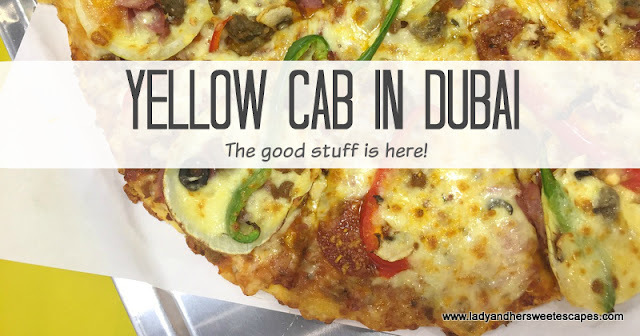 The verdict: Yellow Cab in Dubai is very much alike with the Yellow Cab that we knew! I'm so happy that it's finally here. I just hope that they'll introduce Squad Stuff group meals as well to make the dining experience more budget-friendly. We ate at their Satwa branch when it opened and although we were disappointed with their Parmesan chicken wings, we loved their pizza and charlie chan pasta. It's good to know they now have a second branch in BurJuman. yay! I hope they open Yellow Cab in Singapore too!